If I liked my mama's neighbor's fat cat Willard I would buy this cat house for him. As it stands though, he's a jerk so I don't really care if he gets cold while he's stalking robins in my mama's yard this winter. 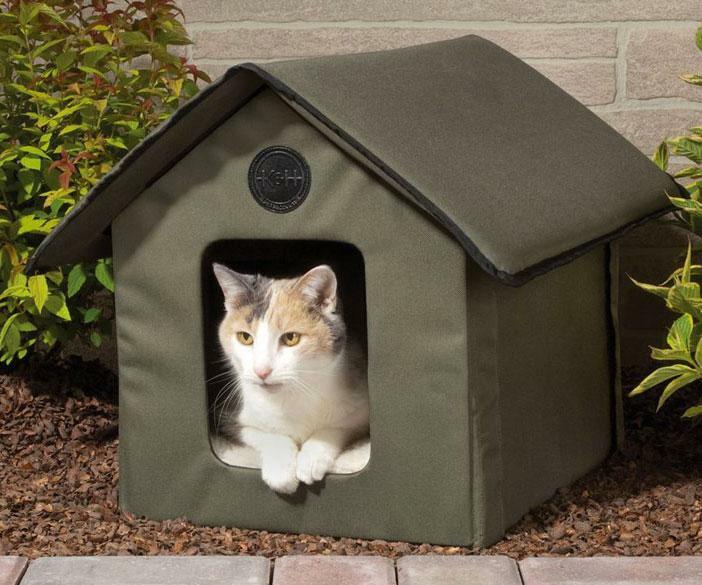 For those of you who have a good relationship with your (or your neighbor's) cat, K&H Manufacturing has made this very highly rated heated Outdoor Kitty House. It's sewn with 600 Denier nylon and a waterproof vinyl backing, and includes a Lectro Soft Outdoor Heated Kitty Bed to keep Toonces toasty when the temperature drops but you refuse to let his dead rabbit breath back inside. The heated bed requires just 20 watts of electricity. Another nice feature: the house has 2 exits so Toonces won't get trapped when the rabbits seek their revenge. You can also buy an unheated version of the K&H cat house. If you're mean.